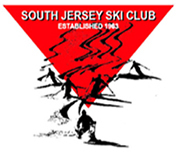 Founded in 1963 to encourage, stimulate and promote the sport of skiing/snowboarding and to organize, sponsor and coordinate ski and social activities for its members... South Jersey Ski Club (SJSC) has been one of South Jersey's leading adult ski/snowboard and social clubs for over 50 years! With an annual membership of over 350 from all over the Delaware Valley and the surrounding area, we have an interesting, diverse and friendly group of winter sports enthusiast. Our ski schedules include trips for all levels of skier and all sizes of budget, while our year-round social schedules are so active and varied, that many members join for them alone! South Jersey Ski Club is a not-for-profit, all-volunteer club. We encourage all members to get involved in club events and activities as participants and event coordinators.. we are at our best through the active support of our membership! Meetings are held the 2nd Wednesday of every month...The meetings are 7:30pm-9:30pm and are casual mixers with a cash bar. All are welcome to come and meet the club with no pressure or obligation. 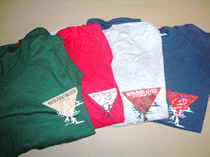 Club T-Shirts... available at the Social table during all general meetings. Club Pins ($3 ea) - available at the Social Table during all General Meeting.